All the fighters slated to participate in tomorrow night’s blockbuster “UFC 116: Lesnar vs. Carwin” event will be tipping the scales inside the MGM Grand Garden Arena in Las Vegas, NV. Stream today’s weigh-ins LIVE right here on 5thRound.com beginning at 7PM ET/4PM PT. 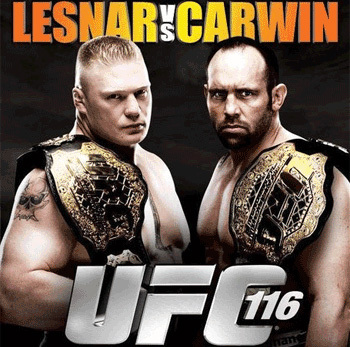 UFC 116 features the highly anticipated heavyweight title unification bout between champion Brock Lesnar and interim title holder Shane Carwin. They were initially slated to meet at UFC 106 last November, then again at UFC 108 in January, however Lesnar was forced out both times due to illness. Carwin gladly collected the crown by posting a 1stRound TKO over Mir at UFC 111 in April. The part-time engineer is perfect through his first 12 MMA contests and has ended all of them violently in the 1stRound.